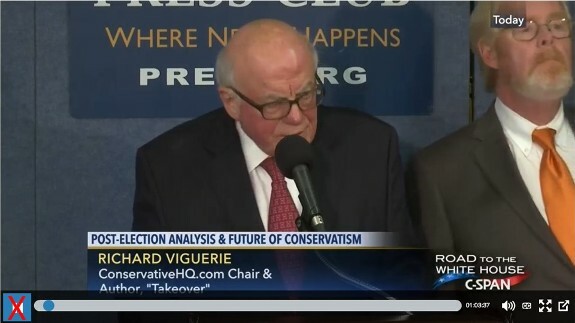 MANASSAS, Va. — In the wake of the announcement that Senior Advisor and Chief Strategist Steve Bannon was leaving the White House staff, ConservativeHQ.com Chairman Richard A. Viguerie asked the question on the minds of many conservatives: Personnel is policy. Does Steve Bannon's departure signal the end of Donald Trump's commitment to govern as a conservative? "It seems that the West Wing is now being run by the liberal Democrats," said Mr. Viguerie. "Gary Cohn, Ivanka Trump and Jared Kushner, General John Kelly, H.R. McMaster, and the Obama holdovers at the NSC, have all survived and thrived, while the conservatives like Steve Bannon, Derek Harvey, Ezra Cohen-Watnick, Rich Higgins, and even the establishment Republicans like Reince Priebus and Sean Spicer, have been run-off." "One wonders if the firing of Steve Bannon signals a general purge of conservatives on the White House staff," observed Mr. Viguerie. "When Steve Bannon and Kellyanne Conway joined Donald Trump's campaign, conservatives were electrified—and many who had previously been skeptical were convinced that a Donald Trump administration would be a conservative administration as long as Steve and Kellyanne were at Trump's side," concluded Viguerie. "As I explained in my book TAKEOVER, personnel is policy, and with few conservatives left in senior positions at the White House, we conservatives are rightly skeptical that Donald Trump's many commitments to us will be fulfilled."